Acne is not fun. If you’ve had it, you know that after a while, it’s all you see when you look in the mirror. It becomes a frustrating fixation and, if you’re anything like me, you may begin to feel hopeless. I recently moved to Ohio and my skin began to change. I broke out with some deeper cystic acne on my cheeks, which was new to me at this point. Cystic acne is sometimes scarier than surface acne, because it’s difficult to tell how long it’ll stick around. I had a few blemishes that were occupying my face for weeks on end, and eventually I decided enough is enough. I decided to have a consult with Allyson. After looking at my skin, she suggested I try IPL. Until this point, I had always thought of IPL as something for brown spots and sun damage, but IPL can do so much more. After just one IPL treatment, I wondered what I should expect to see and was told, “you should only see improvements from here on out”. I was skeptical, but that’s exactly what happened. Fine Lines: I’m 24 years old, but have already started to see some fine lines appear around my eyes, mouth, and on my forehead. I’ve always been extremely expressive, always making faces to make my friends laugh. Because IPL boosts collagen production, many of these fine lines started to fade over the weeks following my treatment. The most noticeable difference was around my eyes. Pore Size: One of the first changes I saw was in my pore size. They shrunk everywhere, especially on my nose. This is a great improvement, because smaller pores mean that future break outs are less likely. Overall Skin Clarity: It took a little while, but the blemishes I had did begin to fade. This is because the IPL targets the bacteria that causes acne. The splotchy redness that I’ve had my entire life began to dissipate almost immediately. When I exercise, this redness usually gets enhanced. A few days after treatment, I actually did a double take when I looked in the mirror at my gym after working out. There was no noticeable redness in my face. After my IPL series, I have the best skin I’ve had in years. 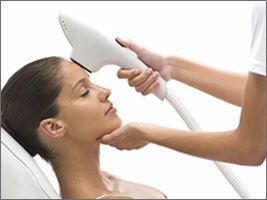 Timeless has several other treatments for acne, but I certainly recommend IPL as a great choice.